To enter to win Dipali's painting, "Owl" go to Daily Paintworks and click on the link at the top of the page announcing their interview. 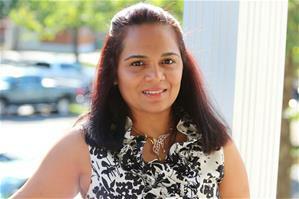 My name is Dipali Rabadiya. I live in a Greensburg, PA (Suburb of Pittsburg, PA) with my husband and two sons. I have always enjoyed painting and drawing ever since I was a child and never stopped thinking about it. I enjoy oil painting a small still life subjects and landscapes from all prima from life. So, I joined the daily painting movement this year. I have been painting since I was a child. Even after graduating from an MBA, I always wanted to be an artist, so I went to pursue my BFA in Seton Hill university in Greensburg, PA in 2009. That program helped me a lot. In 2014, I signed up with DPW and that changed my life. The website was so amazing that I would go through lists of artists that inspired me and wanted to paint daily to improve my skills and be a successful artist. I am very happy with Daily Paintworks. Enter to win by clicking on the link at the top of the DPW home page announcing Dipali's interview. 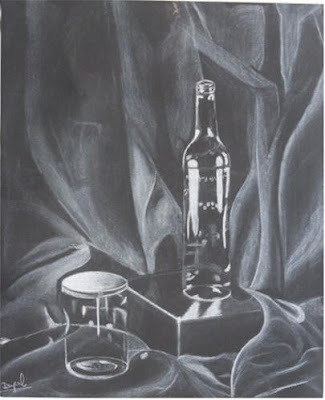 I love to paint in oil colors, but I also enjoy charcoal and sketching. I often work with pencil sketch. 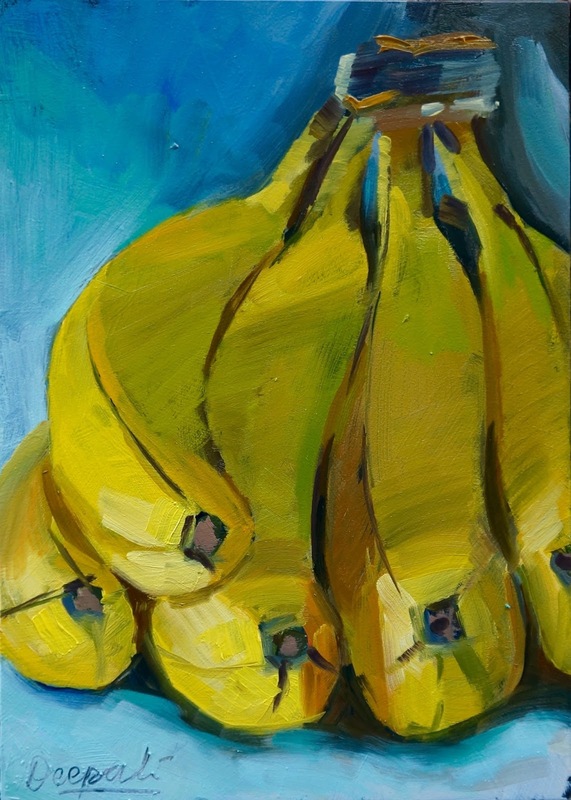 I have tried painting in acrylic and other mediums as well, but I am more into oils. I have tried painting still life, landscape, figurative, seascape and flowers. I have never tried abstract. As far as I know, still life is my strongest genre. I feel comfortable doing it. I am interested in making large oil paintings. I would like my painting to have that loose and spontaneous feel to it. Portrait would be something that I would like to get comfortable with. This is tough question. Lots of artists have inspired me though out my career. I am a big fan of Vincent Van Gogh's paintings. I love Carol Marine as my mentor. She inspires me a lot. I like Qiang Huang as well. 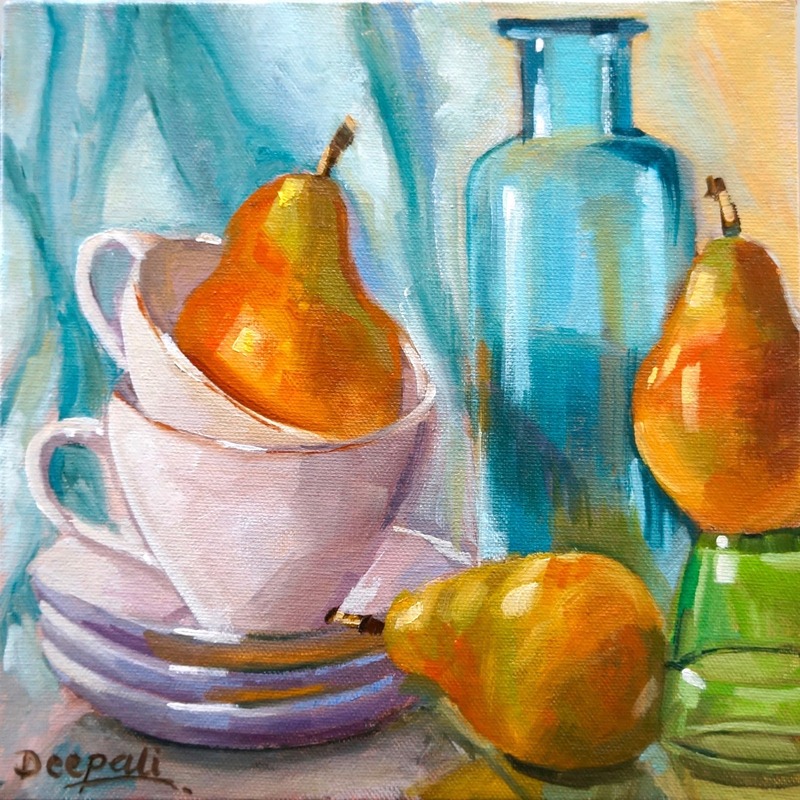 I love to paint still life because it is convent for me. Strong drawing, bold and bright colors inspire me the most. Having two small children in the house makes it hard to paint. When my children are at school, i have assigned that time for my painting. I choose to paint small and frequently. 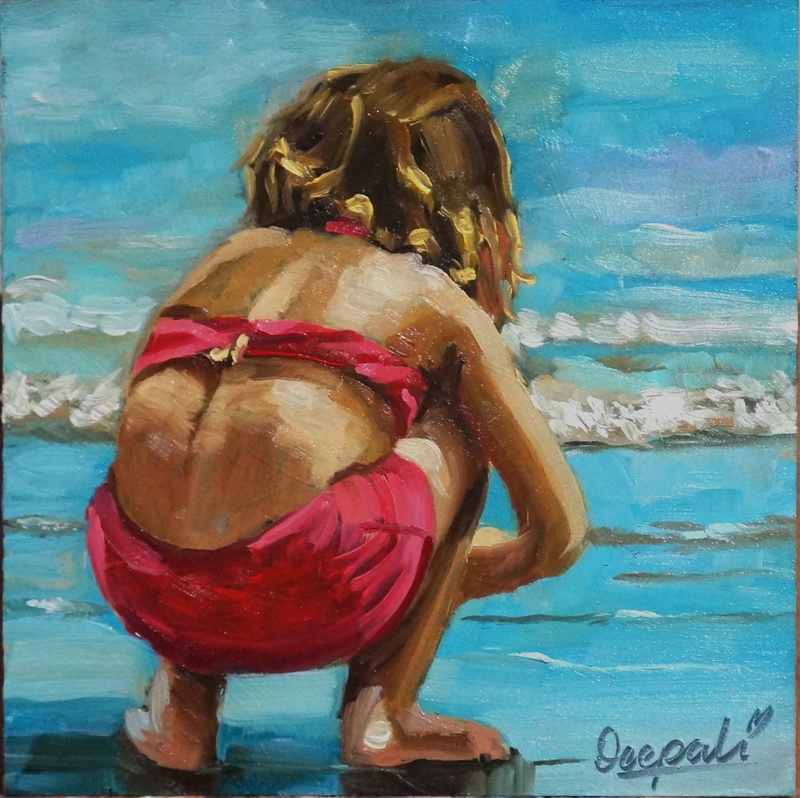 I usually paint 6x6, 5x7, 6x8, and 8x10 size canvas. I have a small studio space in my house where everything is ready to paint. So that solves half the problem. My painting style is alla prima. It means wet on wet/all at once. I finish my painting within one or two hours. Then I take a picture and am ready to post it on DPW, Pinterest, Instagram and my blog. I am also selling my artwork on eBay. I always think before I start arranging my objects in my shadow box. I will have some idea before I even start. Since I like to paint still life, I often open my refrigerator and look for items that I am attracted to that particular day. If I am interested in painting something other than still life, I will go though my vacation pictures and look for something that attracts me as well. I like painting small children playing in the sand or at the beach. I have a limited palette that helps me understand my colors better. It also makes my job easy. I start with a bigger brush and then use a smaller brush. I don’t use a lot of brushes. When I am painting I use maybe three brushes. That’s all. I also change my subject matter often. That helps me keep my art fresh. I feel like I have so much to learn and progress as an artist. I recently took a workshop with Qiang Huang in Scottsdale, AZ. It has given my an idea about how someone can be so successful in this career. All I need to do is keep working and keep improving my skill. My motivation comes from family and resources around me. I want be in a gallery and I want to teach and so on. Joy of painting. The process of creating something and the finished product is absolutely different than anyone can imagine.